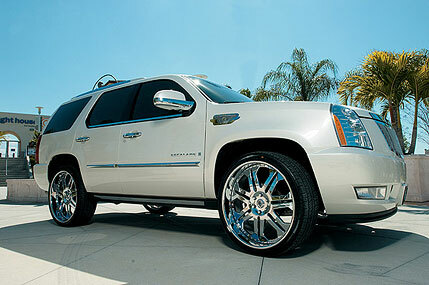 The reigning National League MVP, Ryan Howard has a white Cadillac Escalade on 26″ Chrome Asantis. A big car for a big guy. I am not a big fan of all chrome wheels. But when you go for 26s, all chrome is usually the best choice. The chrome wheels match the chrome trim, chrome side vents and chrome grille very nicely. The car is all white and chrome and looks pretty good. My only problem is the car is now sitting too high that he put 26s on it. You need to lower it a little or else it looks really bad with the big gap in the wheel well. Drop this car an inch or two and it will make a world of difference. Lay off the high fastball a little more and that will also make a world of difference.